I am so looking forward to this Sunday. This Sunday is our outdoor service, our church picnic, and most importantly, the blessing of the backpacks–a service we’ve had ever since before I even joined the church 9 years ago. This is no ordinary church event. During the Sunday school hour, of course the kids play games, eat snacks, and learn about Jesus, all of which are typical for Sunday School. But they also are given the time to go through an assembly line of school supplies, which includes (but is not limited to): pens, pencils, crayons, colored pencils, scissors, erasers, highlighters, folders, paper, notebooks, composition books, protractors, binders, rulers, and even backpacks if the child needs it. I just love that our church does that, because it’s open to all the kids so even if a child is in desperate need of some of these things, he looks just like everybody else in that line collecting school supplies. I also feel like it takes a bit of the burden off of the parents to pick up school supplies, spend extra money, and run around from store to store searching for the best deals. It also gives our church members the opportunity to give back to the community (as the event is open to the community). Create your own event: Whether your church becomes involved or you are just one individual, you too can make a difference. Solicit the help of different businesses and individuals in your area–whether you ask for physical donations or cash donations to purchase goods, gather school supplies, perhaps work with a local organization like a church or social services organization to set up a date and time to deliver to those in need. You can even look into getting stage lighting if you want to go all out! Donate to a local school: If you have the money and can do so, purchase a bookbag and some essential school supplies like those listed above. Deliver the supplies to a local school that has children in need. They will make sure it gets to the right place. Deliver to individuals: Just like above, if you have the opportunity, purchase a bookbag and fill it with school supplies. Then secretly deliver it to those you know are struggling and may need school supplies. Giving secretly can be a lot of fun, and you are still making a difference. Take someone shopping: If you know someone in particular who is in need and want to work directly with the family, offer to take them shopping for school supplies. If you need to collect funds to do this, you can do so, or if you have the funds you can use your own money instead. By doing this, you can find out exactly what the kids need/want, and the same time you have the opportunity to build a relationship with them. 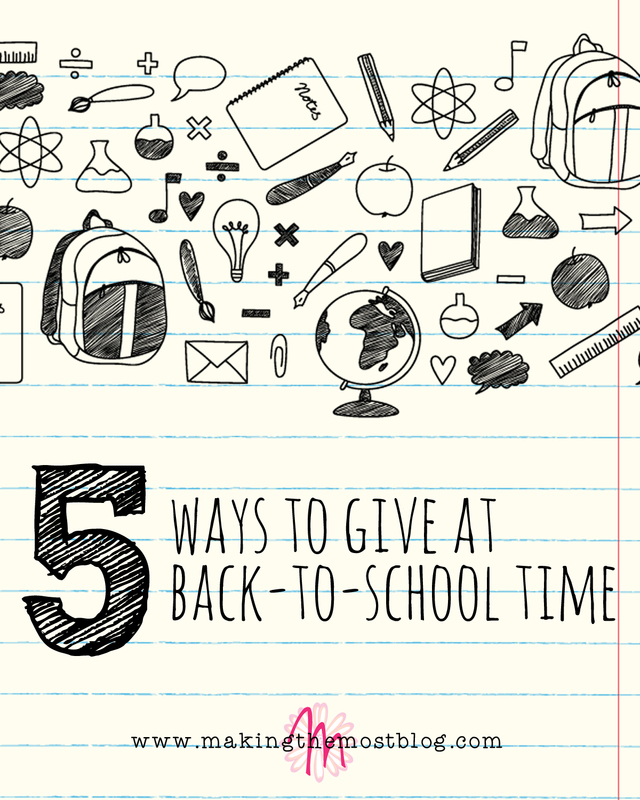 I’m sure this list just scratches the surface of the things you can do to make a difference at back-to-school time. What do you do to give back at the beginning of the school year?